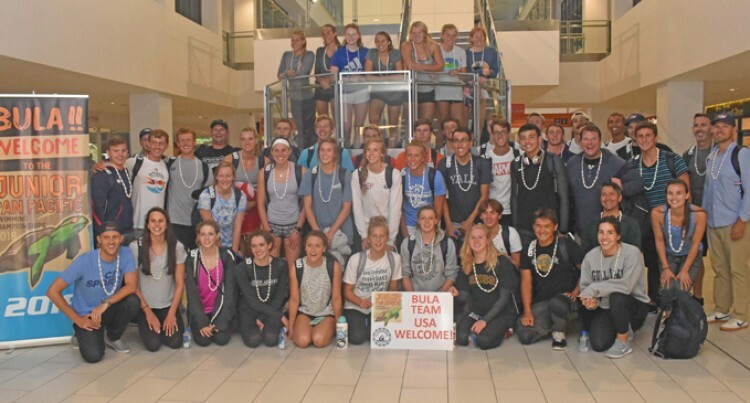 Team USA Swimming at Nadi International Airport on August 19,2018. Photo: Waisea Nasokia. Team USA will be represent­ed by 40 top up-and-coming swimmers at the 2018 Junior Pan Pacific Championships, set for August 23-27. The meet will be hosted at the Damodar Aquatic Centre, in Suva which previously hosted the 11th Oceania Swimming Champion­ships. Technically co-hosted by Fiji Swimming and USA Swimming, the meet will feature athletes from the four Pan Pac charter nations (Australia, USA, Japan, and Cana­da) along with a handful of other Pacific-rim countries, like Singa­pore, New Zealand, South Korea, China, and a large contingent from Fiji. USA team director Mitch Dalton said, “Our goal is to get the people into the finals and when they are in the final they get a shot. He said all the 10 charter nations are looking forward to the competi­tion. “It is very good competition,” Dal­ton said. “Japan looking at their Pan Pac team which they had in Tokyo a couple of weeks ago and which they are looking particularly for Tokyo 2020. The head coaches for the team are Allison Beebe of Santa Clara Swim Club and Dan Flack of Bay­lor Swim Club. The side had assembled in Los Angles before arriving to Fiji yes­terday. They had a swimming and bonding session as a team. Dalton added that all the partici­pants are here in the country for the first time. Men: AJ Bornstein, Ridgefield Aquatic Club, Mikey Calvillo, Adam Chaney, Tim Connery, Ster­ling Crane, Episcopal AmberJax, Ross Dant, Carson Foster, Jake Fos­ter, Ethan Heasley, Arik Katz, Drew Kibler, Danny Kovac, Peter Larson, Destin Lasco, Jake Magahey, Van Mathias, AJ Pouch, Dare Rose, Daniel Roy, Gianluca Urlando.